"THE LITTLE HAMPTONS" : Eyra, Antique Story book Style Cloth and Sculpted Art Doll by The Little Hamptons. Eyra, Antique Story book Style Cloth and Sculpted Art Doll by The Little Hamptons. 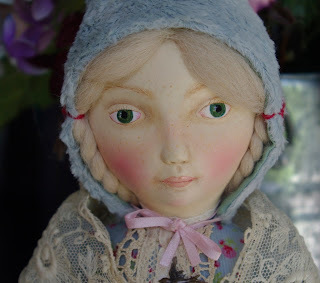 Eyra is my latest doll, inspired by antique story book dolls. I have sculpted her face from Creative Paperclay and hand painted her face, including the eyes. She is made from cotton cloth, and viscose fabric, with antique lace trim. She is fully jointed and stuffed with cotton filling. This girl has a very fairy like look. Her hat is not removable, but her skirt has button fastenings. She has hair made from alpaca with plaits at the back. She has a very winter wonderland look. Eyra is about 13 1/2" tall to the top of her head. Please note that the other doll in the red skirt is in a separate listing.